WE BRING THE MUSEUM TO YOU! DINOSAURS ROCK® offers the most authentic learning experience with our expansive exhibits of museum quality specimens. 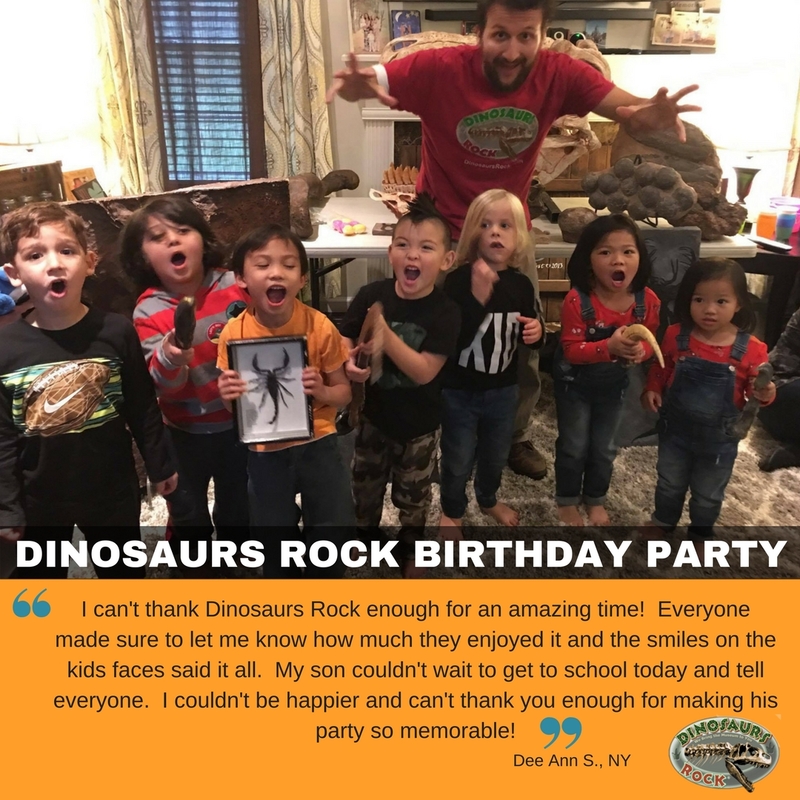 If your child likes dinosaurs – there’s no other party like a DINOSAURS ROCK® JURASSIC BIRTHDAY PARTY. You’ll have an amazing display of giant cast specimens and genuine fossils as well. Specimens we’ve actually placed in Museum around the world. Your party will begin with a interactive presentation where your child is the center of attention and your guests will all interact with the presenter and be able to touch a real fossil dinoaur egg, dinosaur footprint, dinosaur poop and more. Once the dig is completed – GAMES are in order. Your guests will go on a Fun Dinosaur Egg Hunt. Find the egg. Bring it back. Hatch the egg to find a toy baby dinosaur. Then we’ll finish off with a RING TOSS over a Life-Sized T-REX Foot. 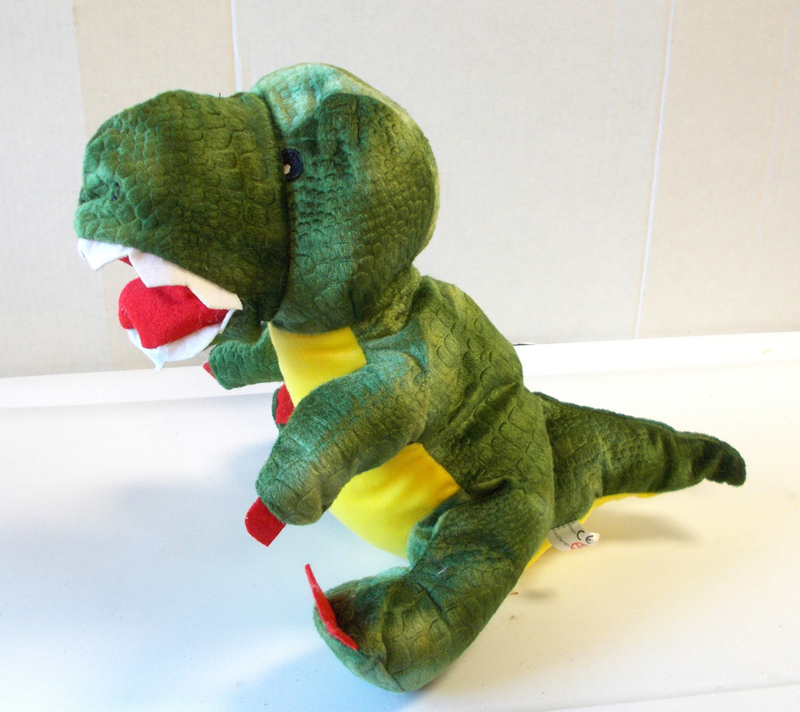 Once the ring successfully goes over one of the T-REX toes – your guest will get another larger toy dinosaur to keep. Our professional staff arrives 1-hr prior to the start of your party to set-up. A-La-Cart Goodie Bags $6.95 each. Our instructors are all highly trained and are very sensitive to your child’s specific needs. Please let us know in advance of any “special needs” or requirements for your child so we can best assist them in having the best party of their lives. Make your DINOSAUR PARTY even more special by making it a STUFF-A-DINO Party. You get the same presentation and amazing display specimens outlined above & you get to create your own 15-inch plush stuffed dinosaur. Name your new beautiful creation and place a real heart inside and make a special wish! Who wants to find a real ruby, emerald or sapphire right at their own home? This and many other beautiful stones can be found at one of our GEMSTONE MINING Birthday Parties. Extend the length and fun of your party. For only $10 additional per child, add in our GEMS EXCAVATION BLOCKS – it’s like being on a Prospecting Adventure and your guests get to take home upwards of 25+ specimens. Discover how rocks & minerals are used in our everyday lives. Panning for Real Gemstones (keep 10 specimens) Rubies, Emeralds, Sapphire, Tourmaline, Amethyst, Citrine, Quartz & More! As Realistic As It Gets! Whether you choose our standard “panning” option seen above or the Excavation Block your guests will be thrilled with all the amazing specimens they get to take home. Imagine, a real shark in your home. Plus, a sting ray, sea stars, jellyfish, a whole host of other fishes from the sea, beautiful seashells, coral, giant crabs, horseshoe crabs, sponges, and lots more. We Bring The Aquarium To You! All our specimens are professional taxidermy and look incredibly realistic. Your Highly Interactive Presentation Can Include a Highly Visual Multi-Media Presentation if a Screen is available. Your Birthday Childs name is highlighted in the beginning and end of the presentation. Dig, find and keep gorgeous seashells from around the world, fish, sea horses, sea stars, sea glass, and fossil shark teeth including the Megalodon Shark Teeth! Games include a Shark Feeding Frenzy Race. Includes a Highly Visual Multi-Media Presentation if a Screen is available. Your Birthday Childs name is highlighted in the beginning and end of the presentation. • Games include a Shark Feeding Frenzy Race. Imagine, a real shark in your home. Plus, a sting ray, sea stars, jellyfish, a whole host of other fishes from the sea, beautiful seashells, coral, giant crabs, horseshoe crabs, sponges, and lots more. We Bring The Aquarium To You! All our specimens are either genuine or professional taxidermy and look incredibly realistic. Ok – I know – it has nothing to do with Oceans – BUT – Kids LOVE THEM!! You’ll learn fascinating facts on how we use items for the Oceans in our everyday lives. Wanna make something really cool? Add in our 30-Million Year Old Fossil Shark Tooth Necklace Making. Your guests will wear them for a long, long time. We want to bring you a HUGE Display and not fill our vehicle up with tables. So if you can help by providing tables (3 minimum) we can give you the BEST & most impressive display. The Ultimate. The Best Of The Best. The Party Your Friends Will Talking About For A Long Long Time! We’ll bring specimens from EACH of our 4 programs with emphais on the Dinosaur Theme. Dynamic Presentation (with expanded exhibit using many of our LARGER SPECIMENS usually reserved only for our Large Scale Events. Get your camera ready. You’ll want to get a bunch of up-close photos of your child & firends next to some of our impressive specimens. A 6-ft wide Spinosaurus Skull! Giant Footprints! 9-ft tall leg! Wow! Included in your EXTREME Birthday Party. Break open beautiful crystal filled GEODES. Birthday Boy or Girl gets X-tra Large Geode! This will be the most talked about Birthday Party you ever had!! It is very important to us that we know exactly how to enter your home or facility – must be flat – no steps as there are many heavy specimens. Driveways are great, backyard porch or even your lawn (in the shade) is excellent as well. One of the best “overlooked” areas to hold your event is your local Ambulance and/or Fire Department as they all have large easy to access party rooms with a lot of parking. Please provide 3 to 4 (6-ft tables) so our specimens do not have to be on the floor.